3 Must See Things In Barcelona - Go For Fun: Travel, Sailing, Photography - Inspiration, Tips, Adventures - Australia and The World! Barcelona is the capital of Catalonia, Spain. It is the second largest city in Spain, after Madrid. Barcelona has many to offer its visitors – historic buildings, monuments, museums, parks, and beaches. Three of most visited tourist attractions are La Sagrada Familia, Casa Batlló, and La Rambla. Basilica and Expiatory Church of the Holy Family, widely known as Sagrada Família, is a Roman Catholic church in Barcelona. It was designed by Catalan architect Antoni Gaudí. Less than a quarter of the project was complete when Antoni Gaudí died at age 73 in 1926. Sagrada Família construction progressed after that but it was a slow process. The construction relies only on donations. The completion date is scheduled for 2026, the centennial of Gaudí’s death. Casa Batlló is located in the heart of Barcelona. 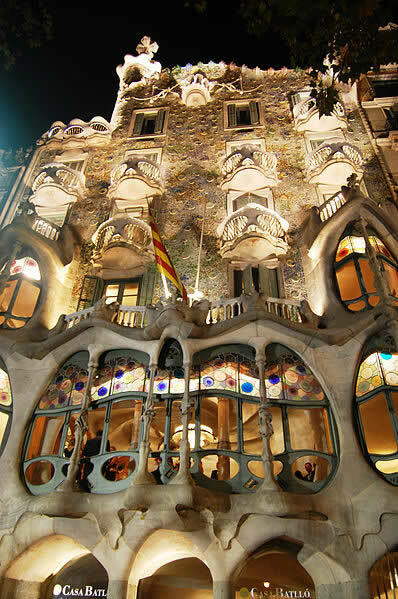 It is another Antoni Gaudí’s great architecture project. Looks like Gaudi tried to completely avoid straight lines in this project. Toursists are allowed to have a look at the interior of Casa Batlló as some floors are opened as a museum. Originally The Rambla was a small stream flowing outside the city walls. Now La Rambla is a famous 1.2 kilometres long street in Barcelona. Often crowded in a tourist season it is primarily a pedestrian area with two narrow one-way traffic roads. What tourists and locals find there? Shopping, human statues, street performers, and quite a few interesting places such as Wax Museum and Erotica Museum. Barcelona has many to offer to avid travellers. It was just three of the most visited places in Barcelona – La Sagrada Familia, Casa Batlló, and La Rambla.